Back Row (L to R): M. Keohan, P. Langan, P. Cashin, B. Mulcahy, T. Brett (background), Paddy. Whelan, M. Organ, T. Collender, S. Lucas (background), L. Fraher, M. Ahearne (background), L. Whelan, A. Hayes, D. Murray (background), D. Whelan, A. Flynn, N. Kelly (background), D. Ruske, R. McCarthy, _ Treacy. Front Row (L to R): J. Clancy, J. Hogan, P. Clancy, Patcheen Whelan, N. McGovern (Capt. ), G. Flynn, G. Foley, T. Barry, M. Fives, S. Power. Seated in Front Include (L to R): N. Browne, G. Fives, M. Fives, C. Fives, P. Langan Jnr., J. Egan. This week's photo shows the Abbeyside Senior Hurling team and supporters at the County Semi Final against Tourin at Lismore. The Village men ran out 5-4 to 1-5 winners, thus securing the club's first final appearance in the senior grade. Our popular Jack the Joker Fundraiser will continue this Sunday night in Kennedy’s Live where the Jackpot will be €5,620 as on Sunday night Margaret Enright was drawn out of the drum and picked card 9 which wasn’t the Joker though she did win €50. Pat O’Brien and Margaret Dwane won €25 each. As well as our group of ticket sellers tickets can be purchased from Convenience Store Ballinroad, The Village Inn, Village Flowers, Kennedys Live, Spar, Mike Kiely’s Butchers and Mousies Takeaway. This Sunday evening we play Brickey Rangers in Fraher Field at 7 pm. Last Saturday evening we played Passage in the County League in Passage and at the end of a high scoring encounter we came away with a good win. TEAM: M. GORMAN, J. POWER, B. LOOBY, E. BERGIN, E. COLLINS, J. O’MAHONY, M. POWER, D. COLLINS, M. O’HALLORAN, E. ENRIGHT, S. O’DONOVAN, S. DALY, T. MURRAY, G. BREEN, S. CLIFFE. SUBS: S. O’CONNOR, D. HENLEY, J. DUGGAN, R. RYAN, B. HENLEY. On Saturday last the club took part in a cycle to training morning. It was a fantastic success with over 100 children taking part. We cycled from eurospar out the track to Seapark around Duckspool and out to the field. Everyone was then treated to Butlers ice cream and all the children received a goodie bag. We would like to thank all the children and parents who helped to make the event a huge success. There are number of Waterford teams in action this week and we have club players involved in all teams. Firstly tonight the Minor Hurlers play Clare in Fraher Field where Conor Prunty plays at wing back and Stephen Cliffe and Sean Daly are panel members whilst Donnacha Enright is a selector. On Saturday the Senior Footballers travel to Carlow for the qualifiers where Shane Briggs and Stephen Enright are on the team and finally on Saturday night the hurlers play Laois in Walsh Park where Richie Foley is on the panel. We wish all the lads the very best of luck in their matches. This Sunday our Club Bingo returns to the CBS Hall at 8:30pm where the jackpot is €800. If there are any members interested in giving a hand with first aid to any of our adult teams at matches we would ask that you inform any club officer of your interest as we are hoping to arrange a First Aid course for any members who are interested. Our underage outdoor hurling continues this Saturday morning the 28th June at the Burgery at 10.30am. All are welcome. This covers all age ranges from under 5 to under 10. Anyone who has not paid their membership yet is asked to pay it on the morning for insurance reasons. Membership forms will also be given out on the morning. Helmets are compulsory and if required can be purchased at a reduced price of €50. There will be a €2 cost also to cover expenses. The annual VHI Cúl Camp takes place at our club grounds this year beginning Monday June 30th. For more information or bookings please log on to their website www.kelloggsculcamps.gaa.ie. This is usually a terrific camp for young kids and one which they most enjoy and look forward to. Big congratulations this week goes out to James Riordan who finished second in the All Ireland under 14 Féile hurling skills competition on Saturday last in the Athletic grounds in Armagh. Being very unlucky not to win James represented his club and county with great pride and skill. This was a marvelous achievement for this up and coming hurler and everyone in the club was very proud of his efforts. Our annual flag day this year for the juvenile committee takes place on July 5th and 6th. Anyone willing to help out on any way is asked to contact Kevin Tobin on (087) 9954448. Our under 14 hurlers travelled to Thurles on Saturday last to take part in the Feile blitz competition. While victory was ultimately not achieved on the day all the lads enjoyed their day out and represented the club with great passion. As part of national bike week the club organized a cycle from Eurospar to our club grounds on Saturday morning last with various pick up points along route. There was a big turnout and everyone who took part really enjoyed themselves. Back Row (L to R): Marie Burns, Betty Tutty, Mary Verling, Ann Higgins, Rita O'Connor, Mary Flynn, Mary Rossiter, Sarita O'Brien, Lenore Byrne. Front Row (L to R): Mary Looby, Aileen Mulcahy, Kathleen Byrne, Isobel Dunford. 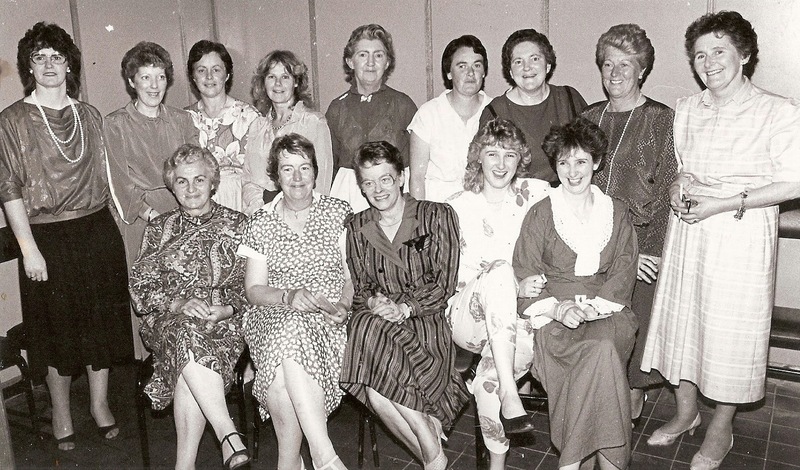 This week's photo comes from the late 1980s and shows the hostesses at an American Tea Party which took place in Clonea Hotel to raise funds for the club. Our popular Jack the Joker Fundraiser will continue this Sunday night in Kennedy’s Live where the Jackpot will be €5,420 as on Sunday night the Breen family was drawn out of the drum and picked card 6 which wasn’t the Joker though they did win €50. Eddie Dixon and Anne Kelleher won €25 each. As well as our group of ticket sellers tickets can be purchased from Convenience Store Ballinroad, The Village Inn, Village Flowers, Kennedys Live, Spar, Mike Kiely’s Butchers and Mousies Takeaway. On Tuesday night last we defeated Stradbally in the County League in Stradbally. On Friday night last we played Ballyduff in Colligan in our third game in the Western Championship and at the end of a high scoring game came away victorious. TEAM: R. RYAN, G. BREEN, M. LAVAN, S. O’GORMAN, S. O’CONNOR, E. BERGIN, M. POWER, P. LYNCH, E. ENRIGHT, M. MAHER, D. HENLEY, D. LOOBY, T. MURRAY, D. FERNCOMBE, D. POWER. SUBS: N. DEE, J. ELSTEAD, J. O’RIORDAN, P. BERGIN. We played Ballysaggart on Sunday last in Cappoquin in the Western Championship and recorded a very good win. TEAM: J.P. McGRATH, A. O’RAGHNAIGH, D. BYRNE, S. O’GORMAN, N. DEE, D. MORRISSEY, D. FERNCOMBE, S. LANIGAN, M. MAHER, O. YOUNG, D. HICKEY, S. FLYNN, D. O’HARE, I. KIELY, R. CONWAY. SUBS: R. COSGARVE, P. BERGIN, S. KIELY, R. PROCTOR, A. MOLONEY. This Saturday evening we play Passage in the County League in Passage. This Sunday our Club Bingo returns to the CBS Hall at 8:30 pm where the jackpot is €750. As part of Bike Week on Saturday 21st June the club will be running an event with the help of Go Dungarvan Smarter Travel. We are asking all club members, parents and children to join us at 9.30 in the Eurospar car park and cycle to the club grounds. There will be collection points along the way at Nugent’s Centra, Monksfield, Seapark, Sallybrook, Friary College and Tournore. Each child that takes part will receive a goodie bag and Butlers ice cream. Hope to see you all take part. On behalf of all in the club we would like to extend our sympathies to the Cashin family on the death of Johnny Cashin, The Burgery who passed away recently. Our underage outdoor hurling continues this Saturday morning the 21st June at the Burgery at 10.30 am. All are welcome. This covers all age ranges from under 5 to under 10. Anyone who has not paid their membership yet is asked to pay it on the morning for insurance reasons. Membership forms will also be given out on the morning. Helmets are compulsory and if required can be purchased at a reduced price of €50. There will be a €2 cost also to cover expenses. Our under 14 hurlers took on De le Salle last Wednesday night at The Burgery in the under 14 hurling county championship. This was a very even contest throughout. De La Salle held the advantage at half time but yet again like the previous week against Lismore our lads showed great determination and no little skill in the second half to win by two points in the finish. Well done to all involved. Back Row (L to R): Jonathan Moore, John O'Driscoll, Richie Ryan, Declan Enright, Ian Kiely, Seán 'Hiker' McGrath, Paul Breen (Capt. ), Pa Enright, Brendan Mansfield, Eoin Enright, James O'Mahony, Eoin Brackett, Stephen Lanigan, Paddy Keohan. 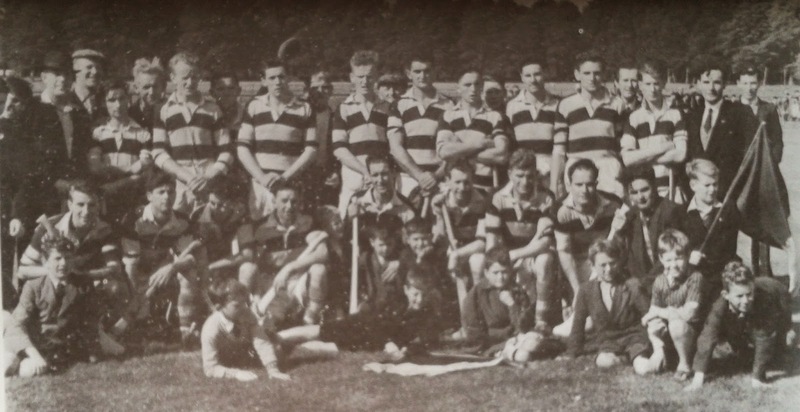 Front Row (L to R): Donal Henley, Alan Tobin, Diarmuid O'Hare, Brendan Walsh, Simon Hanrahan, Declan Fives, Rick Hanrahan, Michael Enright, Stephen Enright, Anthony Flynn. This week's photo features the Abbeyside Junior Hurling team that defeated Ballygunner in the County Final at Walsh Park in 2007. The 2-10 to 1-10 win over the Eastern champions secured the club's first county title at this grade since 1950. Our popular Jack the Joker Fundraiser will continue this Sunday night in Kennedy’s Live where the Jackpot will be €5,220 as on Sunday night Mike Briggs was drawn out of the drum and picked card 17 which wasn’t the Joker though he did win €50. Mary Power and Rita Power won €25 each. As well as our group of ticket sellers tickets can be purchased from Convenience Store Ballinroad, The Village Inn, Village Flowers, Kennedys Live, Spar, Mike Kiely’s Butchers and Mousies Takeaway. On Tuesday night last we defeated Ardmore in the County League. This Friday night we play Ballyduff in Colligan in our third game in the Western Championship at 7:30 pm. We play Ballysaggart this Sunday at 2pm in Cappoquin in the Western Championship. This Sunday our Club Bingo continues in the Park Hotel at 8:30 pm where the jackpot is €700. As part of Bike Week on Saturday 21st June the club will be running an event with the help of Go Dungarvan Smarter Travel. We are asking all club members, parents and children to join us at 9.30 in the Eurospar car park and cycle to the club grounds. Each child that takes part will receive a goodie bag and Butlers ice cream. Hope to see you all take part. On behalf of all in the club we would like to congratulate the Waterford Senior Footballers on their performance against Clare in Ennis last Saturday where they fought back to secure a very good draw. Stephen Enright and Shane Briggs were on the team and we wish them the best of luck ahead of this Saturday night’s replay. Also in Ennis Michael O’Halloran, Mark Ferncombe, James O’Mahoney and Conor Maloney were on the Junior team whilst Eddie O’Halloran was a selector. Finally Richie Foley came on for the Senior hurlers in Thurles on Sunday. On behalf of all in the club we would like to extend our sympathies to the family and friends of the late Ann Casey, Clonea who passed away last week. The Casey family have been great supporters of our club for many years and Ann’s son Eddie won many underage County Titles with the club in the last decade whilst he is now involved in coaching our underage teams. Once again we send our sympathies to Ann’s husband Dan, daughters Gillian, Kathryn and Anna, son Eddie and indeed to all Ann’s relatives and friends. Our under 8 hurling team travelled to Carriganore on Saturday morning last to take part in a ground hurling blitz. After some great performances from the team we came away winning two matches and losing one by the narrowest of margins. Great improvement has been seen in this group in recent weeks and we thank all the lads and parents for travelling on Saturday. As we always say without the support of the parents these enjoyable days out would not be possible. Pride and place this week yet again goes to our under 14 hurling team after they claimed another western championship after a great victory against a gallant Lismore outfit on Saturday morning last at the Fraher Field. This game was right in the melting pot up until the final whistle. Indeed Lismore lead by 4 points with 14 minutes remaining and playing with a strong breeze. However our boys dug deep in the last quarter to come away with a four point win. Well done to all. Our underage outdoor hurling continues this Saturday morning the 14th June at the Burgery at 10. 30 am. All are welcome. This covers all age ranges from under 5 to under 10. Anyone who has not paid their membership yet is asked to pay it on the morning for insurance reasons. Membership forms will also be given out on the morning. Helmets are compulsory and if required can be purchased at a reduced price of €50. There will be a €2 cost also to cover expenses. Standing (L to R): Mai Feehan, Josephine Coyne, Marie Moore, Marie Burns, Donal Verling, Breda Sheehan, Michael Mansfield, Anne Kelleher, Jim Kiely, Ned Keane, Joe Power, Babs Kiely, Paddy Coyne, Johnny Burns, Larry Cliffe, Maurice Cliffe, Danny Lenihan, Teresa Power. Seated (L to R): Joe Cleary, Margaret Cashin, Pat Moore, Brendan Mansfield, Tony Mansfield, Moira Mansfield, Caroline Mansfield. 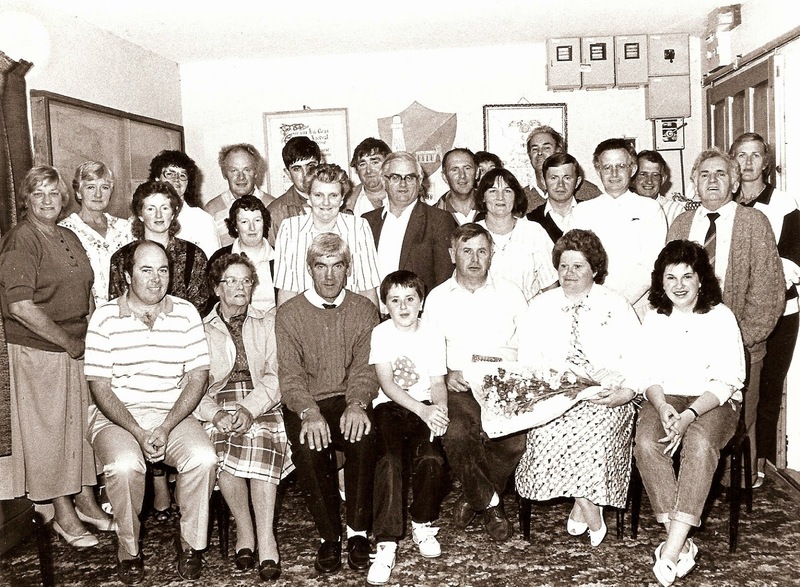 This week's photo comes from 1989 and was taken at the clubhouse in the Burgery where a presentation was made to Tony Mansfield to acknowledge his achievements with the Waterford Senior Hurling Team. Our popular Jack the Joker Fundraiser will continue this Sunday night in Kennedy’s Live where the Jackpot will be €5,024 as on Sunday night Veronica Barry was drawn out of the drum and picked card 47 which wasn’t the Joker though she did win €50. Laura and Maria Cliffe and Fran Hyslop won €25 each. As well as our group of ticket sellers tickets can be purchased from Convenience Store Ballinroad, The Village Inn, Village Flowers, Kennedys Live, Spar, Mike Kiely’s Butchers and Mousies Takeaway. This Sunday our Club Bingo continues in the CBS Hall at 8:30 pm where the jackpot is €650. On Sunday afternoon we were defeated by Cappoquin in the Western Championship in Fraher Field. We have one game left in this championship against Tourin. TEAM: L. POWER, L. BERESFORD, G. BREEN, S. O’CONNOR, E. BERGIN, P. LYNCH, C. KINDREGAN, J. DUGGAN, E. ENRIGHT, S. CLIFFE, L. HURNEY, R. RYAN, J. ELSTEAD, C. PRUNTY, D. HENLEY. SUBS: E. COLLINS, B. HENLEY. Preparations for our fundraising cycle from Limerick to Abbeyside in August are now at a very advanced stage. A specially designed cycling jersey has been designed for the cycle and can be purchased by anybody who wishes to do so. Priced at 40 euro they can be ordered from Michael Cosgrave or Benny Flynn and they could very well become a collectors’ item in years to come as the cycle is on track to be a fantastic success so get your order in quickly to avoid disappointment. On behalf of all in the club we would like to the Waterford Junior and Senior Footballers and Senior Hurlers the very best of luck ahead of their matches this weekend. Our underage outdoor hurling continues this Saturday morning the 7th June at the Burgery at 10.30 am. All are welcome. This covers all age ranges from under 5 to under 10. Anyone who has not paid their membership yet is asked to pay it on the morning for insurance reasons. Membership forms will also be given out on the morning. Helmets are compulsory and if required can be purchased at a reduced price of €50. There will be a €2 cost also to cover expenses. Our annual bag pack took place last weekend in Garveys Supervalu, Dungarvan. The juvenile club would like to thank all those who supported us. We would also like to thank all those who filled slots over the weekend and all those who helped out in any way. Without these dedicated people this event would not have been the success it was .Thank you to all. Our under 13 footballers lost the county final of the football championship on Saturday last at Walsh Park to Gaultir. While we looked tired on the day we must admit we lost to an all round better team. However the lads can be very proud of their efforts and everyone in the club would like to thank them and their mentor’s efforts throughout the year. We would ask that any money not returned yet from the Golden Goal would be returned as soon as possible.